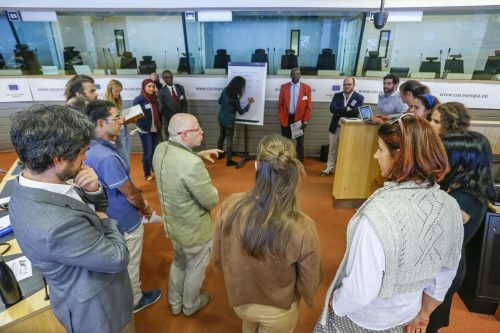 (9 October 2018) In late September ECOLISE was closely involved with two ground-breaking events which took place in Brussels – the Post-growth Conference and its Preparation Day, and the Civil society and municipalities conference co-hosted by ECOLISE and the European Economic and Social Committee (EESC) in collaboration with the Committee of the Regions (CoR) and Transition Network’s Municipalities in Transition project. Here we share reflections on both events by Ilonka Marselis of ECOLISE member, DRIFT at Erasmus University Rotterdam, the other by Tom Henfrey, ECOLISE research coordinator. Ilonka’s blog about the Civil society and municipalities day is published here on the Social Innovation Community website. An initiative of the Research in Degrowth Network led to the European parliament hosting a two-day event on Post-growth, on September 18th-19th 2018. This was preceded for a day-long event for academics at the Université Libre de Bruxelles on September 17th, and a half-day event at the TUED on September 20th. I attended the first two events as a representative of ECOLISE. ECOLISE policy coordinator Meera Ghani joined me for the second day of the Post-growth conference on September 19th. My headline message is that the events both reflected and revealed an epistemological and ethical crisis at the heart of the EU as the failings of neoliberal policy become more evident. One result of this crisis is open up space for serious consideration of progressive ideas that until very recently would have been dismissed as too radical. The Postgrowth conference was an example of this, and represents a significant achievement in entering this space on behalf of the Degrowth movement. It also shows the importance and potential value of our own efforts at policy advocacy, and the potential to build constructive alliances to genuine effect. My recommendation is to continue these efforts emboldened by the knowledge that transformative change is becoming possible as well as necessary. In addition to persisting with our own efforts, I suggest seeking to dialogue, cooperate with and support those being undertaken by the Degrowth community. Degrowth is a largely academic critique of conventional growth-based economics and associated policy. In brief, it notes both the evident failure of continued growth in GDP to translate into increases in general well-being and prosperity, and the deleterious environmental and social consequences of growth in GDP continuing to be a policy goal in itself. It further notes that rhetorical and political commitment to growth in GDP has achieved a quasi-religious status that narrows debates on sustainability to what can be achieved within the growth paradigm. I therefore suggest it is necessarily, both democratically and practically, to broaden these debates to incorporate ideas and measures that do not assume or rely on GDP growth. Further information and references to key primary texts can be found on our wiki at http://wiki.ecolise.eu/index.php/Degrowth. The preparation day assembled around 50 or so Degrowth scholars, each of whom had been asked to prepare a position paper highlighting their key policy recommendations in advance. The morning session consisted of presentations from people with policy expertise and experience, and were intended to give us orientation and inspiration about how policy actually works and measures that can be taken to influence it. I was particularly impressed by the opening presentation by Nicole Dewandre of DG Connect and the JRC of the EU, on her insider efforts to promote both cultural and political change, largely but not exclusively from a feminist orientation, within various EU departments where she has worked. In the questioning following presentations, I was struck by two things. First, a pattern very common in academic settings where male speakers, high in confidence and academic status tended to dominate questioning (or perhaps more accurately, commenting: many adopted a style of academic performance more aimed at demonstrating the speaker’s authority that contributing to constructive debate); this pattern was also commonly evident at many of the larger sessions at the Degrowth conference in Malmö the previous month. Second, comments and questions tended to focus on fine details of the topics in question rather than take a higher level perspective about lessons for strategic efforts to influence policy. In later sessions, we divided into breakout groups discussing participants’ papers, which the organisers had grouped into themes. My paper (which can be read here) was allocated to a session on policy measures, in addition to which I attended a session on governance – though in practice the first session seemed to me to be more about governance, the second on policy. The papers and subsequent discussions confirmed to me a situation that both our current and previous policy coordinator had made in relation to the so-called ‘Policy Briefs’ produced by academics on major EU research projects, that academics (including myself and others associated with ECOLISE) generally lack competence in packaging their insights in ways that allow their effective communication about policy. The sessions were full of creative thinking and wonderful insights, but did not produce anything resembling coherent policy recommendations. However, the day as a whole was an instructive and welcome opportunity to meet and engage in discussion with a group of highly committed and talented academics, most if not all having strong affinity with our work. As one might expect from academics, much attention was given to terminology and definition, in particular the relative merits of the terms ‘Degrowth’ and ‘Postgrowth’, the latter having been adopted for the conference as apparently less threatening to the political establishment. The Postgrowth Conference itself was hosted by ten MEPs sympathetic to it, from all five of the major party blocks in the European Parliament. The majority of sessions, although termed ‘workshops’, were in fact very conventional panel discussions, each chaired by an MEP. Most panels involved one recognised Degrowth scholar, someone else representing a radical agenda, and two people from a more conventional background, many of the latter commissioners or other very senior officials. A marked feature of the discussions was the virtual absence of dialogue. Those representing the conventional position had in all cases not familiarised themselves even in passing with the basic premises of Degrowth, and in most cases simply sought to defend the status quo against their own untutored interpretation of the term ‘Postgrowth’. I was struck by the frequency with which speakers sought to defend the growth paradigm with statements that were either fanciful or simply untrue. Examples in sessions I attended included: the findings of the Limits to Growth Report produced by the Club of Rome in 1972 have been disproven by subsequent experience (in fact they have been largely borne out), that there is no necessary contradiction between GDP growth and sustainability due to the prospect of decoupling (this has resisted all attempts at demonstration and remains a fantasy of the ‘Green Growth’ cult), and that progress towards the Millenium Development Goals in Africa demonstrates the benefits of growth (confusing correlation with causation, much as if an octogenarian tobacco smoker was to claim their longevity was due to, rather than in spite of, their smoking). Seeing people who are intelligent, talented and, presumably (from their support of the event) of high moral integrity publicly resorting to lies and fairy stories to defend positions they clearly know to be untrue, to me shows that we are witnessing the death of a paradigm. In the one case where a panel I attended resulted in genuine dialogue, the sensation of the growth ideology releasing its grip on speakers was palpable. In others where speakers remained resolute in their spoken defense of business as usual, I perceived the cognitive dissonance of those who know that what they believe in no longer fits experienced reality, but are not yet ready to take the uncomfortable step into a new mindset. Several speakers referred to the threat to the European project represented by the far right and rise of nationalist governments, showing real concern that breakdown of the current paradigm will lead to its replacement by something far worse. Others hinted that, in the face of this prospect, EU officials are, behind the scenes, far more open to radical progressive change than they currently feel able to say in public. All this indicated to me a widening rupture in the neoliberal consensus, and an urgent need to occupy this with a political vision that reflects the commitment to sharing, inclusion, cooperation and solidarity that unites community-led movements across Europe and the world. It is also clear to me that we need to bring to this our commitment to diversity, gender equality and inclusive processes. All but one of the panels I attended included precisely one woman, which to me suggested tokenism. Questions and comments from the floor were again dominated by men, leading Philippe Lamberts, the Green MEP whose office organised the event, to introduce affirmative action by taking questions from men and women alternately. In a city as diverse as Brussels, I was struck that the only black faces I saw in the building were outside the event rooms, among the security staff and those serving in the cafeteria. Inside the event, I saw two non-white faces apart from Meera’s and mine, suggesting the lack of racial diversity recognised – though by no means yet addressed – by at least some in our networks is also true of the post-growth movement as a whole. Another blog about the Post-Growth conference, by Renda Belmallem who worked for 6 months at Focus/Friends of the Earth Slovenia, can be found here . In the run-up to the Postgrowth conference, 238 academics initiated a petition to the EU to broaden economic policy beyond the current predominant focus on continual growth in GDP. The petition is now being circulated to a wider public, and can be signed here.